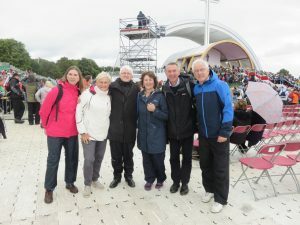 I was in Dublin for the World Meeting of Families, attended by Pope Francis, and was very touched by the whole occasion. 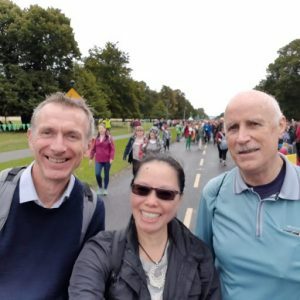 The positive and joyful atmosphere around the various events was a welcome tonic and a sign of hope for a Church which, especially in Ireland, has taken a bit of a bashing in recent times. I was staying with the Columbans, a missionary order that I had first got to know in Seoul when spending a year there. They were a great bunch of mainly Irish priests who had been in Korea for many years and were full of stories that they loved to regale me with. 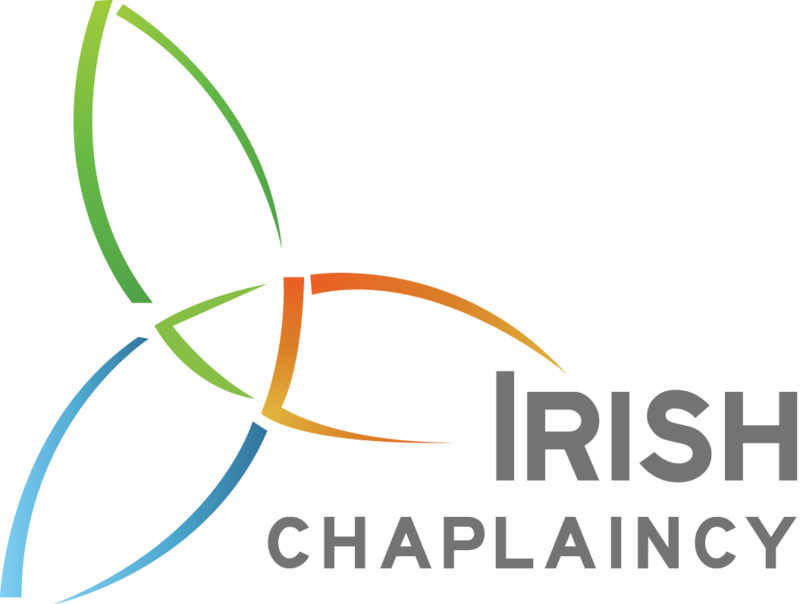 And it was when the Irish Catholic bishops sent nine Columban priests to England in 1957 to minister to Irish emigrants like my own parents that the Irish Chaplaincy was founded. In my first weeks at the Chaplaincy I was asked by several people if I was related to Bobby Gilmore, the Columban who had been Director of the Chaplaincy in the 70s and 80s. “Not that I’m aware of”, was my usual response. But it turned out that Bobby had known my Dad in County Galway and even remembered him leaving in 1949. And on this visit he explained to me how my Dad used to help with the hay-making on his (Bobby’s) aunty’s farm; and that just the other day his brother had been speaking with my own aunty near Glenamaddy. And, it turns out as well that Bobby and I may indeed be distantly related! As they say in Spanish, ‘the world is a hankerchief’! 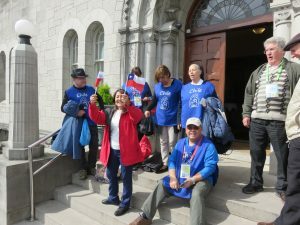 There was a lovely group of people from Chile who were also staying with the Columbans and I travelled in with them on the Friday to the RDS exhibition halls on a little coach they had hired. Denny, a Columban who had lived in Chile, led us in prayer and song in Spanish and English having told us when we set off “this is not a tourist bus, this is a pilgrim bus!” After a long but very good day meeting interesting people from all over the world I was invited to join Denny, the Chileans and a couple of Korean Columbans for food and wine. 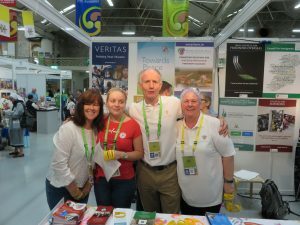 I was on the coach with the group again on the Saturday to go the ‘Festival of Families’ at Croke Park. 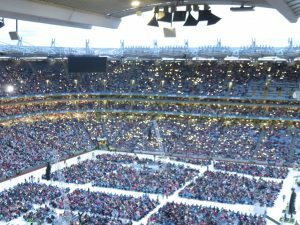 It was a fantastic concert, the highlight for me being the sight and sound of 500 Irish dancers on the stage and around the pitch. As the woman next to me said “that must be the biggest Riverdance in history”! 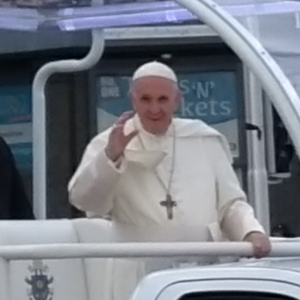 Before going to the stadium I’d wandered down to O’Connell Street where I chanced upon the arrival of the popemobile, and took a photo in which Francis seems to be waving straight at me! 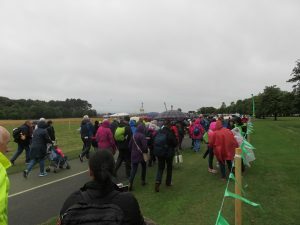 On Sunday it was the papal mass in Phoenix Park and I nearly decided not to go when I’d woken up to the sound of pouring rain! “What’s the point of walking for miles in the rain and standing soaked in a field for hours”, I’d asked myself. I travelled in with Tommy, a Columban who has lived in Beijing for many years and was very good company. We walked the few miles to and through the park with a couple we’d met on the bus and with the thousands of others going along the traffic-free streets. We got chatting to Miranda from Singapore and I mentioned the sole person I know in Singapore and it turned out that she and Miranda are good friends! It really did feel like a pilgrimage and I was glad I hadn’t stayed at home! It was another joyful and uplifting celebration. And especially moving was the Penitential Rite, which is usually a set prayer at the start of the mass: a kind of ‘saying sorry’ prayer. Francis, following his meeting the previous day with eight victims of abuse, read out (in place of the set prayer) a handwritten declaration of apology for those all whose who had been abused by ministers of the Church, and for the inexcusable cover ups of those in leadership. He ended each sentence with the words “forgive us”. 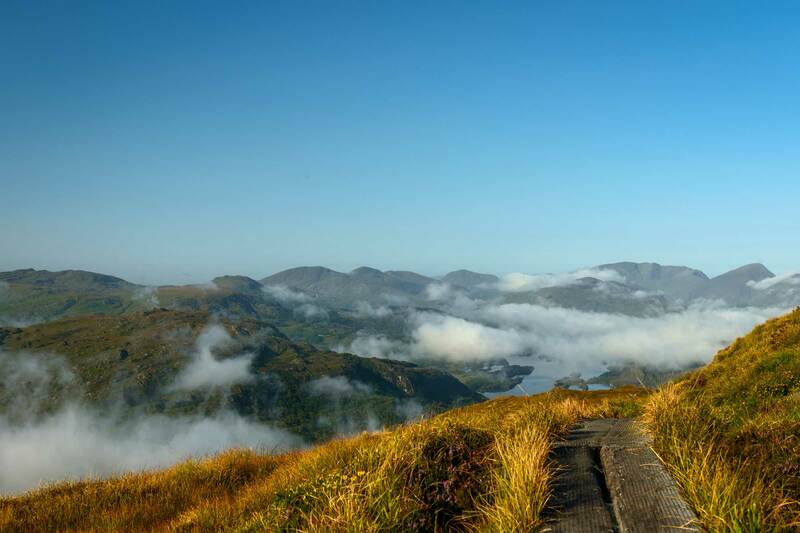 Ireland is certainly a very different country now to that visited by Pope John Paul II in 1979, and the Catholic Church will need to make a slow and painful journey to regain the trust which has been shattered by multiple instances of abuse and cover ups; also to look at what systemic changes need to be made to ensure both that past mistakes are not repeated, and that the Church can become more inclusive and a true and relevant force for good in today’s world. 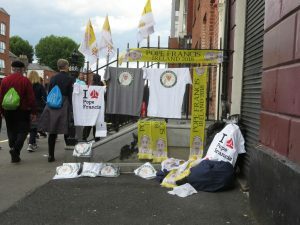 Before the Pope’s visit I was wondering if the Catholic Church in Ireland could ever recover from all that had happened. But having been there in Dublin to celebrate much of what is good in the Church, also to witness the head of the Catholic Church being truly humble and repentant I have renewed hope. And it was interesting to look at the newspaper stands at the airport before flying home. Every single Irish newspaper had on its front page a picture of the Pope. And nearly every one had printed those words spoken so powerfully by Francis in Phoenix Park: “Forgive us”. Saying sorry is not enough in itself, and contrition needs to be accompanied by concrete actions. But recognizing the hurt that has been caused and taking full responsibility is important. 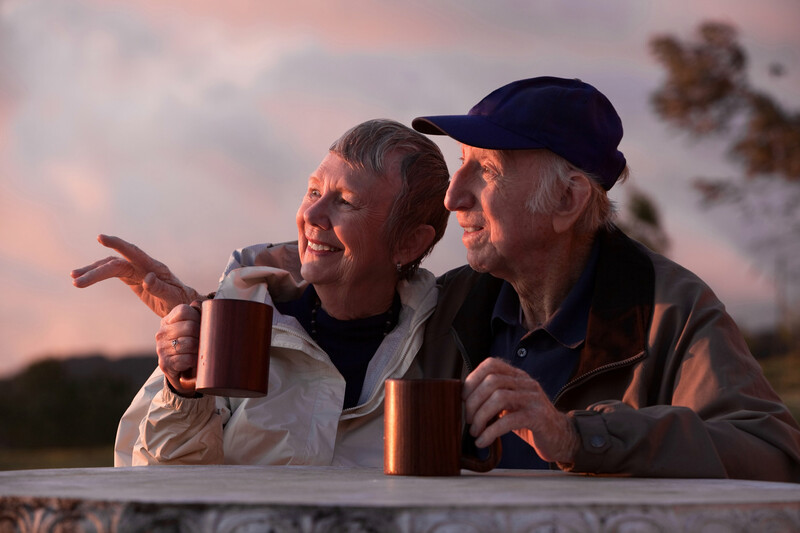 Our world needs more than ever people who can dare to give hope to those in despair, comfort to those in pain, and to be a voice for the voiceless. “Preach the gospel at all times, and if necessary use words”. Enjoyed reading the Blog. I too was in Dublin via Belfast. 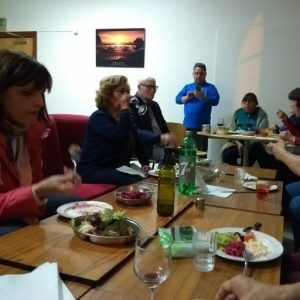 Travelled there and back in a family group of 7 as part of my sister’s parish. 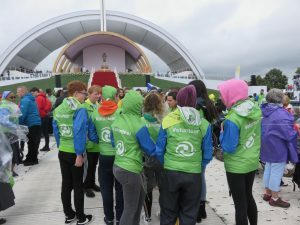 Very lovely experience and whilst a bit damp at time the joy and fun and the words of Pope Francis made up for the walking and bus journeys. Also meeting and talking to people around us and the coincidences with two strangers that we shared friendships with the same people. Also the Press Coverage from both sides of the North divide comprehensive and fair.Also in Belfast went to see the recently released film about Pope Francis. Lovely viewing and would recommend it. There are many things that are wrong in the world and possibly wrong within the Roman Catholic Church but Pope Francis is reaching out to help ensure the wrongs of the past do not happen again and that those who have been hurt or damaged in some in the past are recognised and are cared for, and that if appropriate necessary sanctions and actions are looked at both by Church and Civil authorities. Ahh, Eddy, ya tell a good yarn – and many a true one too! You have a storytellers way about you. Keep it up. There’s hope for the homeland – and her Church – yet my friend.